Since the release of Apple’s larger-screen iPhone handsets last fall, the company has entered a new era of growth. My forecasting models suggest the company will deliver impressive rates of revenue growth through this fiscal year and through at least FY2016 which commences in late September. While the iPhone currently delivers about 70% of the company’s reported revenue, the resurgent iPhone product line along with the rising popularity of Apple’s Macintosh line of personal computers will boost the rates of growth of constituent accessories and services such as the forthcoming Apple Watch and a new TV service expected this fall. The fast rates of revenue growth expected through at least FY2016 are due not only to the success of the iPhone, but also Apple’s ongoing geographic expansion. Apple will soon reach one billion product and services customers across the globe with the Macintosh line, the iPad line and the company’s robust eco-system of apps, content and services playing important supporting roles in the company’s fast rates of growth. Concurrent with the release of December quarter (FQ1 2015) results in January, Apple’s management changed reporting of revenue on a regional basis. Apple eliminated the reporting of revenue of its global franchise of retail stores as a separate regional revenue segment and incorporated the revenue from the stores in the geographic regions in which the stores are located. The company also provided retrospective reports for fiscal years 2012 through 2014. 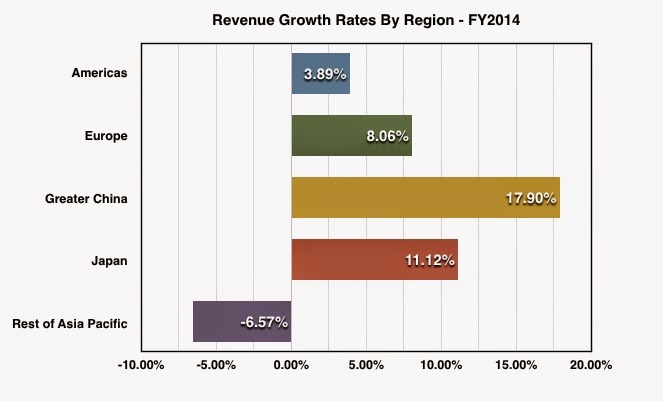 The graph below illustrates Apple’s revised regional revenue mix for the fiscal year that ended last September. 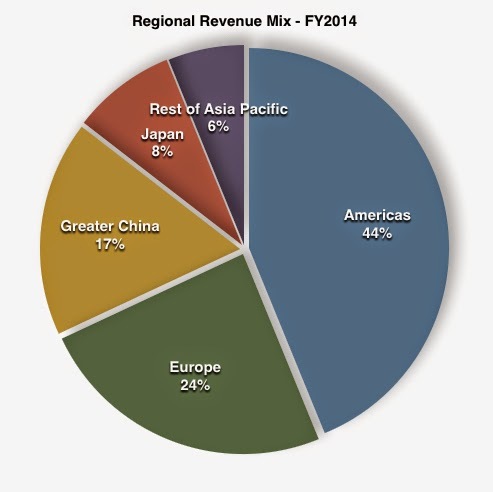 For the fiscal year, the Americas and Europe regions combined represented 68% of reported revenue. Greater China, Japan and the Rest of Asia Pacific comprised the remaining 32% of the company’s reported revenue total. Apple’s highest concentrations of retail stores are in the US, Canada and Europe. The reporting of retail store revenue in the regions in which the stores are located provides a clearer picture of revenue activity on a geographic basis. 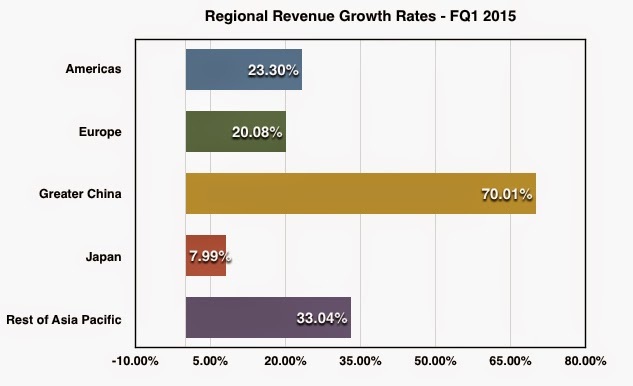 The graph below illustrates the rate of growth by region in a fiscal year in which aggregate revenue rose at a modest 6.95% rate. Greater China was the fastest growing revenue region while Japan also delivered double-digit revenue growth. The Rest of Asia Pacific region realized a revenue decline in the 12-month period. The graph below illustrates Apple’s regional revenue mix in the December quarter which includes the first full quarter of iPhone 6 handset sales. 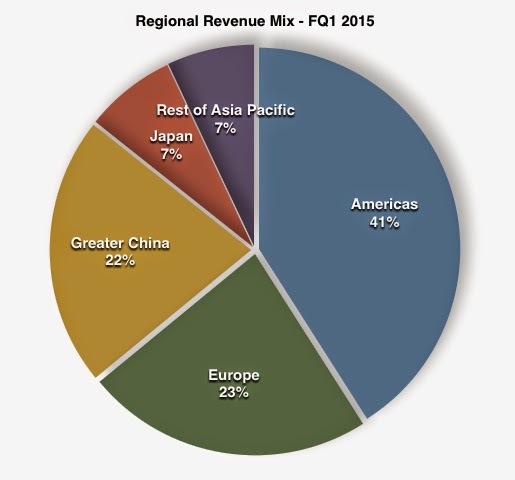 The Americas and Europe regions combined to represent 64% of reported revenue while Greater China, Japan and Rest of Asia Pacific delivered 36% of reported revenue. In the December quarter revenue rose year-over-year by 29.53% with Greater China delivering 70% growth. Despite significant foreign exchange headwinds, Europe realized 20% revenue growth with Japan’s rate of revenue growth falling to about 8%. Apple’s change of fortune in the Rest of Asia Pacific relates directly to the release of larger-screen iPhone handsets while the Americas region continued to deliver revenue growth at a slower rate than the rate of growth for the company as a whole. The graph below illustrate the dramatic change in revenue growth rates by region following the release of of the iPhone 6 handsets. On unit sales growth of 46% in the December quarter, iPhone revenue rose 57% due to the ASP or average selling price for the iPhone rising year-over-year by $50 to $687 even with the foreign exchange challenges Apple experienced in the period. There’s good news moving forward for Apple’s revenue performance from the Services and Other Products revenue segments. The illustration below details the revenue performance of the two segments over the most recent thirteen fiscal quarters with linear trendiness. Concurrent with the release of December quarter results, Apple also eliminated the separate reporting of iPod unit sales and revenue. iPod revenue is now consolidated in the Other Products revenue segment. iPod unit sales have been in decline on a year-over-year basis since the June quarter (FQ3) of 2009. The decline in iPod sales was the sole factor in diminished revenue of the Other Products segment throughout the referenced period beginning with FQ1 2012. Apple’s acquisition of the Beats product lines, the company’s expanding global economic footprint and the iPod line’s fade to oblivion are factors in what will be rising Other Products revenue on a year-over-year basis as early as the March quarter of FY2015 that ended today. Apple’s Services revenue segment has delivered gradual yet fairly consistent revenue growth over the 13-quarter period. It’s now widely expected Apple will be releasing an upgraded Apple TV as early as WWDC in June and a new TV service that will commence distribution of content as early as this fall. HBO NOW becomes available to Apple devices owners next month. The number of iTunes account holders continues to rise by the day. The graph below illustrates the combined revenue of the Services and Other Products revenue segments over the 13-quarter period. In FY2014, the two revenue segments represented just under 14.5% of Apple’s revenue total. In the December quarter, the combined revenue of the two segments fell to 10% of reported revenue due to the fast rise of iPhone revenue in the period. However, following release of the Apple Watch line next month and the addition of anticipated new services, the two segments will experience much faster rates of growth moving forward. At this time I remain steady in my expectation of FY2015 revenue of $235 billion and earnings per share at or above $9.25. At this time the Wall Street consensus revenue estimate for FY2015 stands at $226.15 billion and the consensus eps estimate is $8.64. For FY2016, my forecasting models suggest revenue reaching to or above $275 billion while the Street’s revenue estimate for FY2016 remains decidedly conservative at $238.42 billion. Greater China may remain Apple’s fastest growing revenue region through FY2016 as the company expands the coverage of its retail store network in the region through the opening of new stores in calendar years 2015 and 2016 and as the major Chinese cellular services providers continue to expand the reach of 4G/LTE service. Combined with the appeal of larger-screen iPhone handsets, the availability of higher-speed cellular services has boosted demand for iPhones in the region. In addition to fast-rising iPhone unit sales and the comparative strength of the Macintosh line of personal computers, Apple’s Services and Other Products revenue segments will deliver very strong growth through the release of the Apple Watch and through the release of Apple’s new content services. I expect gross margin to remain fairly steady over the next several quarters and for net income per revenue dollar to remain above 23% as the rate of revenue growth exceeds the rate of growth in operating expenses through at least the March quarter of FY2016. Painting with numbers suggests an attractive profit picture through the entire iPhone 6 series handset cycle along with strong revenue and profit growth from the delivery of new products and services.